These high-quality, double-pole switches from Switchcraft™ are found on Fenders and other guitars, amps and pedals.Black plastic lever is 3/8" (9.53mm) tall, and mounting screws are included. 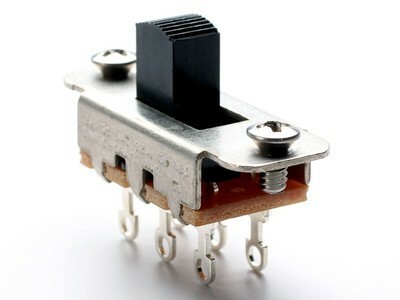 On-On slide switch, Switchcraft, for Jazzmaster® & Jaguar®, with screws. For Jazzmaster and Jaguar guitars. DPDT (double-pole/double-throw), on/on switch has six lugs, three on each pole.